Manny Pacquiao is a ten-time boxing world champion in eight different weight divisions. He's arguably one of the best boxers of all time. His 2007 knockout of Oscar De La Hoya made him a star across the world. His bouts against Antonio Margarito, Miguel Cotto and an epic four-fight series with Juan Manuel Marquez made him a fan favorite. Not only did he win, but it was usually a firefight from bell to bell. When you see and hear about Pacquiao, you think of boxing not basketball. Pacquiao stands at 5'6", and doesn’t have a freakishly long reach. He began his career in the flyweight division (114.6lb. max) and now fights as high as 154lbs. There is nothing about his physical makeup that suggests he would make a good basketball player, or even a mediocre one. That hasn't stopped him from taking on a role as player and coach of the newly formed Kia Sorentos in the Philippine Basketball Association. With the 11th overall pick in the 2014 PBA draft, Kia Sorentos took Pacquiao, positioned as a guard. How much playing time he gets remains to be seen (the season hasn't started yet), but he is expected to be a member of the team both on and off the court. Perhaps more so than his play on the court, Pacquiao's influence and advantage to the team will come in his connections. It was announced recently that Metta World Peace, formerly known as Ron Artest, was in talks to join Kia Sorentos for the next season as an import player. Metta World Peace, who is currently in the process of changing his name to ‘Panda Friend’, was a professional basketball player in the NBA from 1999 until the 2013-2014 season. In that time, he played for the Chicago Bulls, Indiana Pacers, Sacramento Kings, Houston Rockets, L.A. Lakers and the New York Knicks. Throughout his career, he averaged 13.8 points over 930 games played in the big leagues. 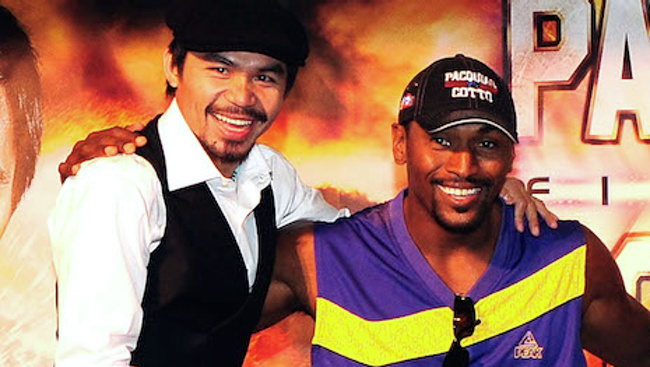 If somehow Pacquiao could convince Metta World Peace to join Kia Sorentos, it would be a huge coup. Although Metta World Peace averaged 4.8 points per game in his final year, it has to be taken into consideration he was playing for the 37-45 garbage New York Knicks. The season before with the L.A. Lakers, he averaged 12.4, nearing his career average of 13.8. 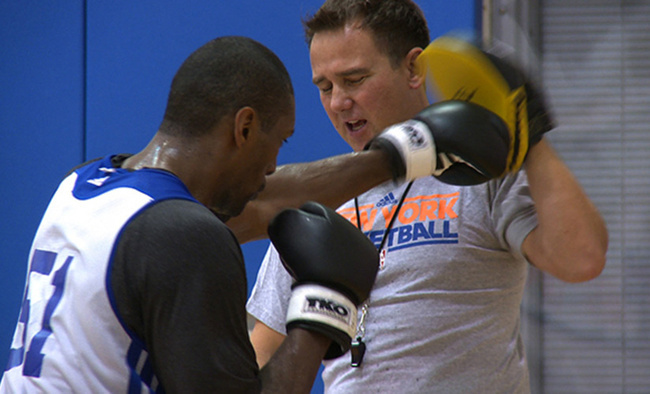 There's irony in having a fighter bring Metta World Peace in to play basketball, since one of his biggest stand out moments was an incident involving his fists and very little basketball. In what has now become one of the most infamous moments in NBA history, a brawl broke out on November 19, 2004 during a game between the Indiana Pacers and the Detroit Pistons. The brawl, dubbed the 'Malice in the Palace' saw Metta World Peace (Artest at the time) leap into the audience and begin fighting with fans, which sparked a wild scene that saw players, fans and security in a heated incident. As a result, Metta World Peace missed 86 games and was traded to the Sacramento Kings shortly thereafter. Maybe he's more of a headache than it's worth, or maybe Metta World Peace is exactly the kind of eccentric character necessary to kick off a new team's inaugural season. At 6'7", Artest would be the largest player on the Kia Sorentos team (their center, usually the largest player on any court, stands only 6'4"). With a team and league made up of mostly Filipino players who have never played at any kind of high level, Metta World Peace would be able to walk in and dominate the league. Don't try telling me that American audiences wouldn't be all over a reality television show on Metta World Peace dealing with the cultural differences in the Philippines. The Philippine Basketball Association may have just made their league worth watching. Pacquiao to World Peace for the jump shot? Metta World Peace (or perhaps Panda Friend by then) mowing down fans after a bad game? Yeah, I'd watch that.